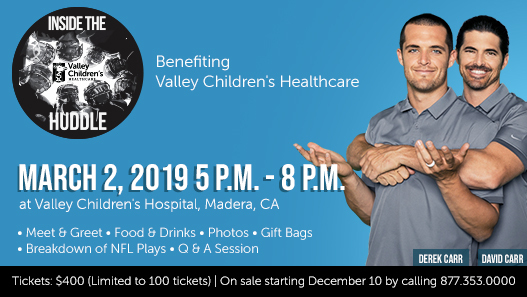 (Madera, California) – Raider Nation and Fresno State fans will have an opportunity to hear from quarterback Derek Carr, and his brother, NFL Network analyst and coach David Carr. Tickets for “Inside the Huddle” go on sale Monday, Dec. 10, and all proceeds benefit Valley Children’s. “Inside the Huddle” takes place March 2, 2019, at Valley Children’s Hospital. Doors open at 4:30 p.m. and the event starts at 5 p.m. Fans will hear the Carr brothers break down and analyze the top 5 plays of the Raiders’ 2018 season. The pair will also answer audience questions. The evening will conclude with a drawing – raffle tickets will be given to every guest who attends. Derek will call up two lucky guests to each receive signed No. 4 jerseys. The event is limited to 100 VIP guests. Tickets are $400. To purchase tickets, call 877-353-0000. The Carrs are longtime supporters of Valley Children’s. Derek and Heather Carr established DC4KIDS in 2015, two years after the birth of their first child, Dallas. He was born with potentially life-threatening congenital anomaly of his intestines. Dallas was rushed into emergency surgery at Valley Children’s. He underwent two more surgeries and spent 23 days in Valley Children’s Level IV Neonatal Intensive Care Unit, the highest level of care available for neonates and infants between the Bay Area and Los Angeles. Today, Dallas is a healthy, rambunctious preschooler. David and Melody Carr are also advocates for Valley Children’s. Our pediatric specialists care for three of their five children, who have type 1 diabetes. Valley Children’s also has an outpatient center in the Carrs’ hometown of Bakersfield – Eagle Oaks Specialty Care Center. The DC4KIDS campaign is intended to fund the most immediate needs at Valley Children’s. DC4KIDS helps Valley Children’s Healthcare meet the needs of the more than 1.3 million children who live throughout Central California. To date, DC4KIDS has raised more than $400,000 for Valley Children’s.